CAJAMARCA, Colombia, Jul 13 2009 (IPS) - In a protected area of the Cordillera Central, Colombia’s central mountain range, gold mining plans are clashing with the desire of farmers, activists and environmental officials to preserve forests and water resources. A movement made up of 25 international, national and local non-governmental organisations is calling on the government to halt the exploration activities of the South Africa-based mining giant AngloGold Ashanti. The corporation, which has been working in the area since 2006, is awaiting authorisation to conclude explorations of a gold deposit situated in the municipality of Cajamarca in the central-west department (province) of Tolima, and within the Central Forest Reserve. The area holds important water resources, with 160 headwaters and the Coello River basin, as well as the ecosystems that sustain them: high plateaus, cloud forests and both protected and productive forest areas, according to the department’s top environmental authority, Cortolima (Tolima Autonomous Regional Agency). In the last decade, the company obtained permits to explore 27 areas of Tolima, including 15 in rural Cajamarca. The authorisations came from the Colombian Institute of Geology and Mining, a division of the Ministry of Mines and Energy. In 2006, AngloGold Ashanti discovered the gold deposit. In December 2007, the corporation announced that the La Colosa site – initially estimated at 12.3 million ounces of gold – would be one of the world’s 10 largest gold deposits. The firm hired 400 workers in January 2008 and stepped up exploration, taking water and soil samples from 74 perforations that were “up to 700 metres deep,” said Evelio Campos, coordinator of the NGO Ecotierra de Cajamarca. By law, companies must apply to the Ministry of Environment for a permit for economic activities in protected zones. This allows for delimiting an area where there is only grass and stubble, but it is intended for basic works that do not affect protected species, Bonilla explained. But because the company had failed to apply for the permit, Bonilla’s petition for a freeze was accepted. “In February 2008, the mining work was suspended by order of the ministry,” economics student Cristian Frasser, of the University of Tolima and member of the NGO Environmental Awareness (Conciencia Ambiental), told Tierramérica. But in May of last year, the company formalised a request to operate on 515 hectares in order to determine the project’s economic and environmental viability, and the Ministry of Environment gave the green light, but for only 6.4 hectares. Hiring has been cut down to no more than 30 workers, but it is impossible to obtain precise figures because information about the mining project is restricted and the army is guarding access to the mining site itself. La Colosa is located 5.5 km from the town limits of Cajamarca and 35 km west of Ibagué, the departmental capital. The population of Cajamarca is about 25,000, mainly small farmers and rural workers. 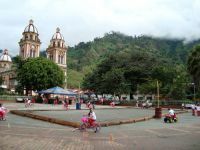 A few are merchants, with shops around the central square, a required stop when travelling between Colombia’s central and western regions due to its proximity to the Pan-American Highway. The rural portion of Cajamarca municipality is approximately 500 square km that includes a range of mountain altitudes, where a variety of crops are grown, depending on the temperature: coffee, fruit and vegetables like arracacha (Arracacia xanthorriza), a tuber cultivated in cooler climates. The Catholic organisation Pax Christi Netherlands, lawmakers from across the political spectrum, the Attorney General’s Office and the Ibagué environmental prosecutor Diego Alvarado have all joined in the campaign against mining at La Colosa. “For the lixiviation they will use cyanide, which makes it impossible to believe that this activity could be compatible with soil use in areas that are forest preserve, if cyanide contaminates the groundwater,” said Alvarado. A study conducted by U.S. hydro-geologist Robert Moran, hired by Pax Christi, estimated that the operation would need “one cubic metre of water per tonne of ore processed per second” in order to separate out the gold. According to Moran’s report, if an estimated 20 to 30 million tonnes of ore is processed per year, it would require 630 to 950 million cubic metres of water annually, or 9 to 24 billion cubic metres of water over the life of the mine, which is projected to be 15 to 25 years. That level of consumption would exhaust the water supplies that feed “the aqueduct for crops, with 400 kilometres of canals that irrigate rice, sorghum and cotton in the central and south of the department, and which supplies water to five municipal aqueducts,” activist Paola Robayo, a forest engineering student at the University of Tolima, told Tierramérica. “We know the influence that AngloGold Ashanti has in highly corrupt countries like Colombia, which is why we wouldn’t be surprised if they end up changing the legislation,” said activist Campos. Last month, Rafael Hertz, chair of the company’s Colombia affiliate, told the press that the ministry’s decision is expected in July. In the meantime, AngloGold Ashanti has invested in community development projects. “They are painting houses, paving streets and making donations to schools,” said Campos. The firm also sponsored the Folkloric Festival of Ibagué, held annually during two weeks in June.